Fans of Hergé’s original “Tintin” comic series have noticed that a major recurring character has been missing from both footage and casting announcements connected to the upcoming Steven Spielberg and Peter Jackson film adaptation. Today, ComingSoon.net had the opportunity to speak with both directors at the Comic-Con press conference and asked directly whether we’d be seeing Professor Calculus on the big screen this December. Unfortunately, it looks like The Adventures of Tintin will be a non-Calculus affair. The lack of the character , who is introduced by Hergé in the two-part story that the feature film adapts (“The Secret of the Unicorn” and “Red Rackham’s Treasure”), could point to significant changes to the source material. 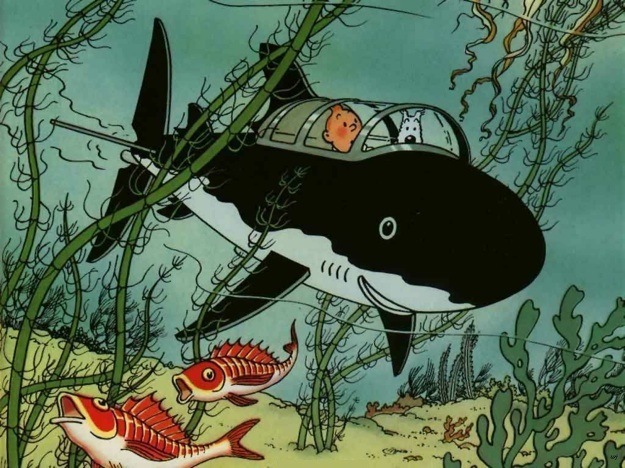 An eccentric inventor, Calculus (Tournesol in the original Belgian strips) is responsible for constructing the shark submarine (pictured below) that both features heavily in the plot and has become an iconic image of “Tintin” lore. “I’m just really happy to know that you know Calculus. That makes me very happy,” said Spielberg, suggesting that western audiences will likely not notice the character’s absence. Should a sequel move forward, it has been suggested that Jackson and Spielberg (the former directing this time) will adapt the two-part adventure “The Seven Crystal Ball” and “Prisoners of the Sun,” the source material for which both continue to feature Calculus in with some prominence. Despite the lack of the Calculus character, “Tintin” fans can look forward to seeing the familiar faces of Tintin (Jamie Bell), Snowy, Captain Haddock (Andy Serkis) and Thomson and Thompson (Simon Pegg and Nick Frost) on the big screen in 3D, 2D and IMAX 3D when The Adventures of Tintin hits theaters on December 23rd. If you missed our live blog of the panel on Friday, you can read an archived version here.